The ACEP Scientific Assembly is coming up next week in Boston. I am presenting 3 lectures. Since I wrote the lectures a few months ago, I am starting to review what I wrote! Conferences usually have speakers submit all their lecture material months before the conference. I thought I would share some of the basic rules that I follow in building powerpoint presentations. I find that you can be the best speaker in the world, but if you have visually-distracting slides, your talk comes out only average. These are only my opinions, and you should develop your own style and preferences. I typically choose a sans sarif font such as Arial. I find it easier to read on a screen. Less busy than sarif fonts such as Times. Be sure that the font size is large enough so that audience can read the slide from over 30 feet. Choose a non-busy dark background. Notice the great speakers will have a very unobtrusive dark background. The next time you are at one of Dr. Amal Mattu’s talks, check out what background he uses. I think it’s just a plain black background. Use only only a few text colors. I use 2-3. Generally they are yellow (headers), white (main text), and light blue for emphasis. These colors pop off a black or very dark blue background. Make the images large enough so that everyone can notice the details. Be sure images are high-resolution and not grainy. Another pet peeve of mine. It makes you look lazy if you have a fuzzy image of a xray, EKG, or clinical finding. Don’t use an image if you don’t need to. It’s distracting. Referring back to my Monday post about how our brain learns on my blog at AcademicEM.blogspot.com, the goal of teaching should be to maximize “germane load” (relevant information) and minimize “extraneous cognitive loads” (white noise which doesn’t contribute to learning). To me, transitions between slides falls in the latter. The same goes for busy transitions between sentences. On busy slides with lots of text, I sometimes use a transition feature such that lines of text appear only when I talk about them. If you want to be even more geeky (like myself), check out the Presentation Zen blog. The author Garr Reynolds has some really great ideas on presentation, coming from the perspective of a designer. 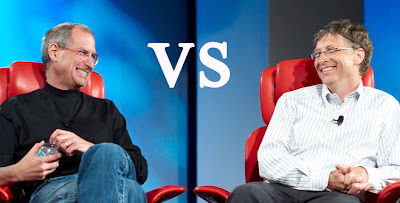 I especially love the blog post where he compares the contrasting presentation styles of Steve Jobs and Bill Gates. No wonder Mac is kicking PC’s bottom. This entry was posted on Tuesday, September 29th, 2009, 8:21 AM and is filed under Uncategorized. You can follow any responses to this entry through RSS 2.0. You can skip to the end and leave a response. Pinging is currently not allowed. It’ll cost you $7, but is absolutely worth it. Besides, your library probably has a copy or can get you one. His books are brilliant as well, and should be required of anyone writing about or with data.